Aspinal of London the classic English luxury accessories brand has joined forces with Être Cécile, the label for the true fashion girl, created by Yasmin Sewell, Jemma Dyas and Kyle Robinson. 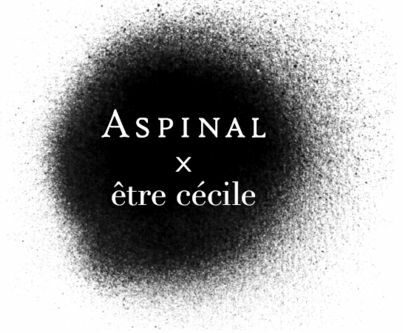 The result is a pleasing juxtaposition of the classic chic of Aspinal and the clever, bold and witty aesthetic of Être Cécile. The collaboration was inspired by Yasmin Sewells experience of creating a bespoke Aspinal of London bag with the brands Creative Director, Mariya Dykalo. Mariya describes the experience as a breath of fresh air "It was so exciting to see the bold approach Yasmin took with our product, the confidence to break up the panels and think about the three dimensional form of a handbag with the same brave aesthetic she applies to the Être Cécile ready to wear". A collaboration between the two brands was the natural next step. Yasmin, Jemma and the Être Cécile team selected their favourite styles from the Aspinal of London collection and re-worked them as an extension of the Être Cécile AW15 collection. The collection features bold use of contrasting panels of colour in calf and rubberised leathers, soft nappa leather printed in plaid, applied in an out of proportion scale and bold 1990' s inspired graphics. The result is a departure from the reliably chic style for which Aspinal of London is better known. The balance of beautifully crafted, functional, classic shapes and bold, playful fashion confidence is an exciting direction for both brands Yasmin describes the collaboration as subversive, in the best English fashion tradition "I love the idea of taking something grown up, classic, serious and messing it up , having fun, taking it to an unexpected place. The brands are so different, it's the unexpected contrast that excites me. Mariya and I both love the collection, we're going to be fighting over the samples until the collection hits the stores this September!" The collection spans five key bag styles including the chic ladylike Mayfair bag, the cute mini trunk clutch, the sporty rucksack and mini rucksack and the utilitarian essential tote. The hero bags are accompanied by a range of small leather accessories and notebooks. Our Press Presentation will take place during London Fashion Week AW15 for the first time.